In honor of John McCain’s new tactic of “damn the country, I’m going to win at all costs”, I’ve created a new campaign sign that reflects this new reality. Enjoy! 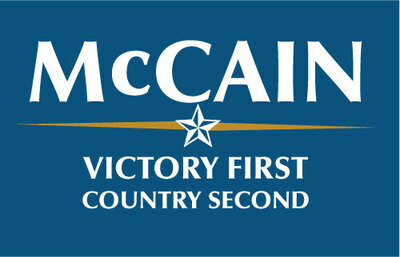 I know you’re a McCain supporter, but really Obama’s policies would suit you much better. Obama’s tax plan calls for cuts in taxes for those who make less than $230K. And he’s not taxing company health care benefits like McCain’s proposing. No – as someone who is not a minority, Obama will NOT suit me better. I’m sorry but I don’t buy into Jeremiah Wright and that is a HUGE issue for me. I also have a huge issue with socialistic healthcare and leaders who will not protect our security. Once again – agree to disagree. So, you don’t think children should all have access to healthcare? And that the rest of us who don’t have corporate jobs shouldn’t have access to affordable healthcare? McCain’s support of the Iraq war shows that he has no clue on how to keep our country safe. Osama Bin Laden runs free and we’re stuck in a war in the wrong country. I guess we can disagree on this and still be friends. Well, considering I have had to make signficant life changes to provide healthcare for my children and my kids have been denied programs such as early preschool due to the fact that they are not a minority – I guess my view is a little different. It’s sad because kids are caught in the middle. I think people need to be responsible for their actions and there are certain things (welfare being a BIG one) that really rub me the wrong way. Reverse discrimination angers me just as much as racism, too. I think we should all be held accountable for our actions and we should all be valued on character and work ethic. But, you shouldn’t have had to make a life change to provide healthcare for your children. And your children shouldn’t be denied programs either. But, the main reason for that is that there isn’t enough money for education in the system so the disadvantaged are favored. I think there should be more money for education, but the Republicans don’t agree on that either.